This detailed space wallpaper shows the central parts of the nearby active galaxy NGC 1433. The dim blue background image, showing the central dust lanes of this galaxy, comes from the NASA/ESA Hubble Space Telescope. This detailed space wallpaper shows the central parts of the nearby active galaxy NGC 1433. The dim blue background image, showing the central dust lanes of this galaxy, comes from the NASA/ESA Hubble Space Telescope. 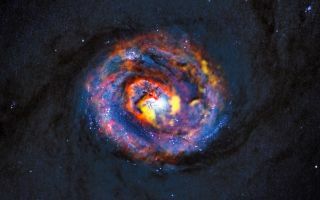 The colored structures near the center are from recent ALMA observations that have revealed a spiral shape, as well as an unexpected outflow, for the first time. Image released Oct. 16, 2013.